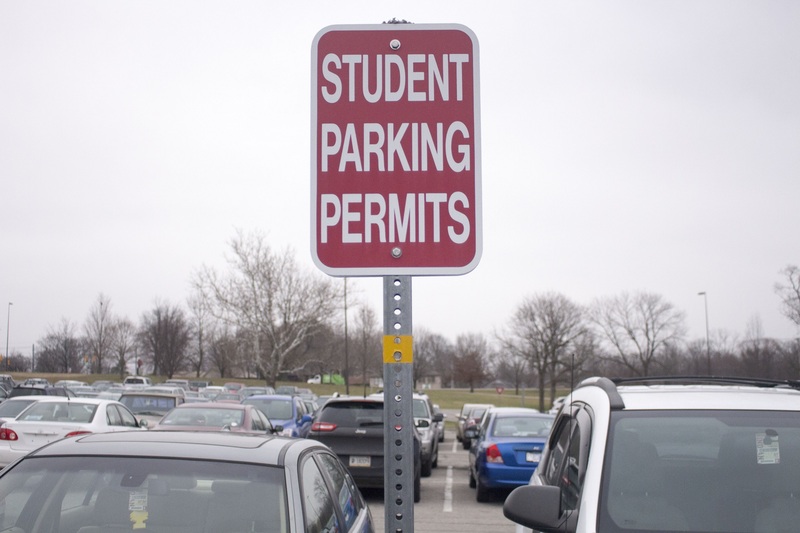 Student Parking zone signs are visible in all parking lots on the IU Southeast campus, designating where students are allowed to park. College is a time when students often make many life decisions that can have a lasting impact on who they are and how they want their life to be. When making the transition to college, students at IU Southeast have the option of either living on campus or commuting. With a limited amount of on-campus housing, students must make the decision in a timely manner and consider all of their options. For Caitlynn Pfaadt, communication senior, living at home with her parents was the perfect choice. Living in Louisville and being fewer than 20 miles from campus, Pfaadt said her commute time is only 20 to 25 minutes one way. When Pfaadt was a freshman, she said she attended Pikeville University, which was almost three hours from her home. When she was there she had to live on campus because of the distance from her home. Pfaadt said if she were in the same situation while going to IU Southeast she would live on campus, but since she is so close, she wants to be able to save the money and says she enjoys staying with her parents. Pfaadt said one of the main benefits of living with her parents is the cost effectiveness. She said she does not have to worry about paying bills and she can commute for a fair price because her car gets great gas mileage. 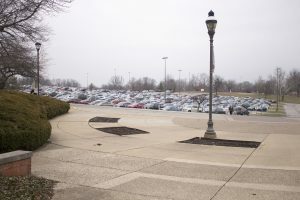 A large portion of students who commute to IU Southeast park in one of the many parking lots on campus. Although she said she enjoyed living in the dorms at her previous university, she said she would still choose to live at home, even if given the opportunity to live on campus for free because of all the benefits she has by staying with her parents. If giving advice to incoming freshman, Pfaadt said she would recommend living on campus for at least one year and then looking into getting a nearby apartment. Although Pfaadt said she prefers commuting, she said living on campus is an experience everyone could gain something from..
Just as Pfaadt lived on campus for her first year of college, some students prefer to stay on campus for their college careers. When it comes to living on campus, Rebecca Ochoa, computer science junior, said she feels that living at IU Southeast is the perfect choice. “I live on campus because I live three hours away, so I’m not from around here,” Ochoa said. Ochoa said that getting an apartment would be considerably more expensive and that living on campus saves her money. Alongside saving her money, Ochoa said that some other benefits of living on campus include never having to worry about a commute time, traffic or construction. “You can be anywhere on campus within 15 minutes and that’s if you’re walking really slow,” Ochoa said. Ochoa said the only negatives of living on campus is the possibility of getting difficult roommates, although it has never happened to her. She also said sometimes neighbors can be a little noisy. However, Ochoa said her favorite thing about living on campus are her roommates. She said her roommates and her have similar life issues and day-to-day experiences, making it so there is always someone to come home and talk to about what is going on in their lives. Ochoa said learning to be self-sufficient, learning to take care of yourself and learning to get along with other people are some other benefits to living on campus. 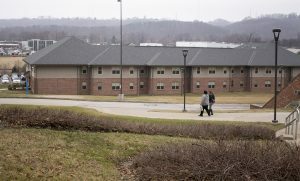 The dorms at IU Southeast are located behind the main buildings on campus and can be seen from many different areas on campus. The Housing website offers a getting started checklist for those who are considering living on campus. Some of the items on the checklist include filing an application for housing, applying for financial aid and requesting a roommate. Housing also offers suggestions to keep in mind when applying to live on campus, including that the application is usually for a full academic year and students who wish to break the contract must have specific reasoning. According to Housing, some of the amenities of living on campus include fully furnished dorms, high-speed Internet access and cable TV, and a fully equipped kitchen. Also, the Housing website has information about meal plans and dining options, rates and floor plans, what to bring, and safety and security information. If students are interested in living on campus and would like more information, they can email liveon@ius.edu, call 812-941-2115, or visit the Housing Office in Meadow Lodge, room 103. Each student has a unique situation and determining what works best for them is their choice to make. IU Southeast gives students options to suit whatever their needs may be.